How to get easy money in GTA Online? As we reported yesterday, GTA Online is available for play and we hope that you are already enjoying this fantastic multiplayer adventure. We would like to reveal some secrets of GTA Online or, to be more exact, tell how to get easy money in the game. 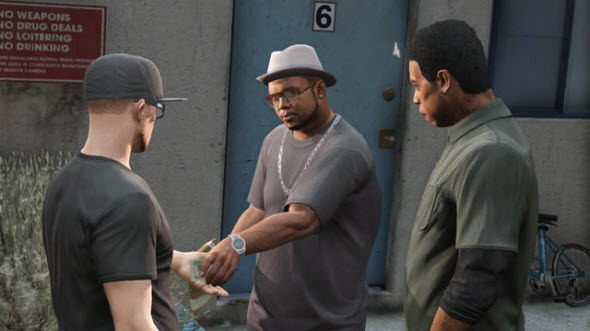 In GTA Online every car, house or customization items cost a lot, and to buy them you need to earn some money or to purchase in-game money for real dollars. If you don't want to spend on GTA too much , our advices will be useful for you. So, let's start. The most obvious way to get money in GTA Online is to rob some store alone or with a group of other players. But of course, these missions are not really easy and sometimes you don't get very big amount of money from the first levels. To get money really quickly and easily, you can sell the stolen car. We are sure that you know how to steal the cars in GTA, so it won't be a problem. The average car costs about $10,000 that is pretty much. But don't try to steal and sell very luxury sports cars, because underground fences don't like buying them. And the last detail: you can sell only one stolen car per in-game day. If you are killed in the game, all your money will disappear. To avoid this sad situation, deposit all your earnings. It is rather easy and can be made from your mobile phone. And do you have any ways to get easy money in GTA Online? Share your experience in the comments below.